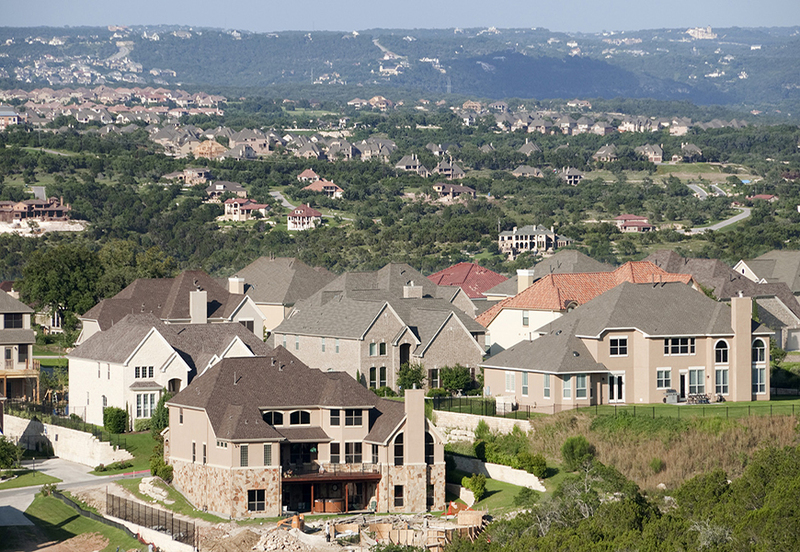 How profitable are Texas houses as an investment? An ongoing research project at the Real Estate Center at Texas A&M University found that Texas homes are more profitable than the national average, and significant variations in profitability exist across the state's metropolitan housing markets. Owner-occupied homes are both consumer goods and investment goods. Once a house is built, it generates streams of current and future benefits in the form of rental incomes and streams of costs in the form of maintenance, insurance and taxes. From an investment perspective, homes have to compete with alternative investments such as bonds and stocks for profitability measured in terms of yield or rate of return on investment. Investors in asset markets compare yield returns on different assets and channel their investing funds to assets generating the best returns. Over time, yields or rates of return on various investment goods in asset markets tend to converge to their long-term equilibrium values. Several methods exist for measuring the profitability of housing investments. 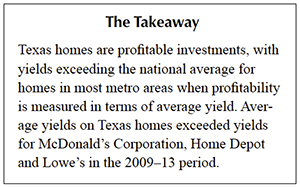 This research project used net rental yield because financial data for Texas homes was readily available. For stocks, dividend or earnings yield is computed by dividing total dividends or earnings paid during a period by the stock price. In real estate economics, gross rental yield and net rental yield are used to measure the profitability of rental properties as investments. Gross rental yield is simply annual rent as a percentage of the property price. For instance, if annual rent for a house is $24,000 and the house price is $200,000, the gross rental yield is 12 percent. This is the return on investment before the homeowner's costs. Net rental yield on homes is computed by dividing net profit from renting a house by the house price. Net profit is equal to annual gross rent minus annual housing costs including property tax, insurance, maintenance costs and management fees. If annual operating costs for our example total $18,000, annual net rent is $6,000, resulting in a net rental yield of 3 percent. Net rental yields are also called capitalization rates or cap rates. Data for computing net rental yields on Texas homes were collected from the 2009–13 datasets of the U.S. Census Bureau's American Housing Survey. The data are five-year averages of median gross rents, median homeowner costs, and median home values for 2009–13. Both the rent and housing cost data in the survey include costs of utilities. When housing costs are deducted from rents, the resultant net profit or net rent figures are net of the costs of utilities. 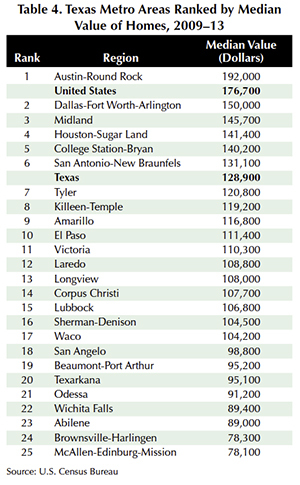 Table 1 shows Texas metropolitan areas ranked by median annual gross rent. Austin-Round Rock had the highest gross rent from 2009 to 2013 followed by Midland, Dallas-Fort Worth-Arlington, Houston-Sugar Land and Killeen-Temple. The median gross rents for these five Texas metro areas were higher than the statewide average. The first three metro areas had gross rents even higher than the national average. At the bottom of the table, Brownsville-Harlingen had the lowest gross median rent followed by McAllen-Edinburg-Mission, Texarkana and El Paso. Homeowner costs are the second component for computing net rental yields. Table 2 presents Texas metropolitan areas ranked by homeowner costs (taxes, insurance and maintenance costs). 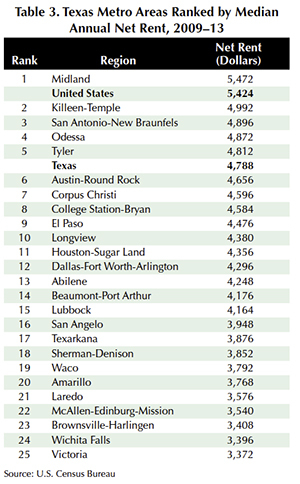 Austin-Round Rock had the highest owner costs followed by Dallas-Fort Worth-Arlington, Houston-Sugar Land, Midland, College Station-Bryan and Victoria, all higher than the national and statewide averages. McAllen-Edinburg-Mission had the lowest owner costs followed by El Paso, Brownsville-Harlingen and Longview. Deducting homeowner costs from gross rents for each Texas metropolitan area results in net rental income (Table 3). 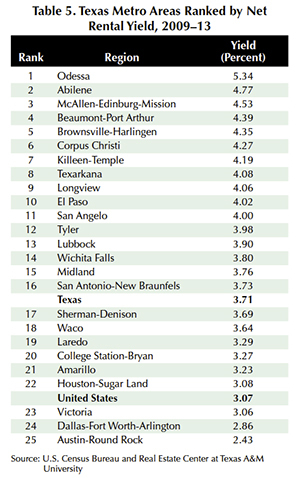 Midland had the highest net rent, even higher than the national average, followed by Killeen-Temple, San Antonio-New Braunfels, Odessa and Tyler. Victoria had the lowest net rental income followed by Wichita Falls, Brownsville-Harlingen and McAllen-Edinburg-Mission. For computing net rental yields, net rental income for each metro area is compared with the median home value for the area. 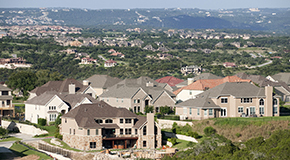 Texas metropolitan areas are ranked by the median value of owner-occupied homes in Table 4. Austin-Round Rock had the highest home prices, even higher than the national average, followed by Dallas-Fort Worth-Arlington, Midland, Houston-Sugar Land, College Station-Bryan and San Antonio-New Braunfels. Dividing net rent for each region from Table 3 by the median home value for the region in Table 4 and multiplying the resultant number by 100 gives net rental yields (Table 5). The average net rental yield for Texas from 2009–13 was 3.71 percent, well above the 3.07 percent for the United States. 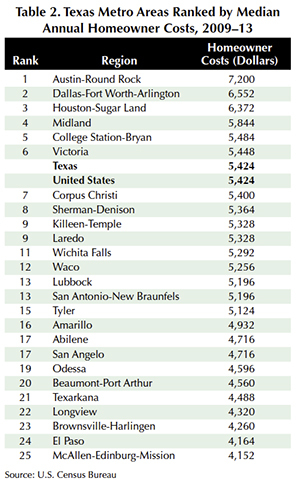 Odessa had the highest net rental yield followed by Abilene, McAllen-Edinburg-Mission, Beaumont-Port Arthur and Brownsville-Harlingen. 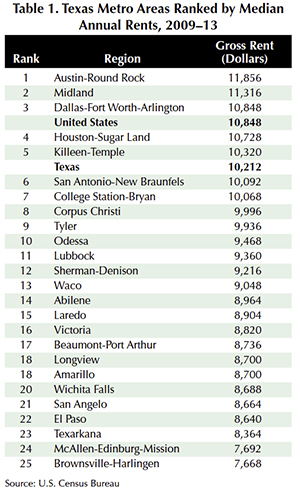 At the bottom of the rankings are Austin-Round Rock, Dallas-Fort Worth-Arlington, Victoria and Houston-Sugar Land. Comparing median home values in Table 4 and net rents in Table 3 shows that the main reason for lower net rental yields in the metropolitan areas of Austin-Round Rock, Dallas-Fort Worth and Houston-Sugar Land is their higher home prices. For comparison, five-year average dividend yields for McDonald's Corporation, Home Depot and Lowe's were 3.30 percent, 2.2 percent and 1.7 percent, respectively. ​The net rental yields in Table 5 are before-tax net rental yields because the net rental incomes are before taxes. When considering a home as an investment, keep in mind that real estate properties are the least liquid investments and rental incomes and owner costs are volatile. Compare price appreciation to general inflation, tax considerations and capital gains. Given that an owner-occupied home provides shelter for a long time, gains from housing as an investment are valuable additional advantages for homeowners.